Deputy Chief of the medical clinic at the United Nations Economic Commission for Africa, in Addis Ababa. Please provide a bit of your background. How did your prior work give you the perspective to face the medical challenges here in Liberia? I am from Ethiopia and have worked for the United Nations for the last 17 years. I trained internal medicine, graduating as an internist. I have also studied gastroenterology and endoscopy, as well as management of HIV/AIDS. Before working in Addis Ababa, I worked as a medical doctor in rural Ethiopia. It was challenging to leave my family, and being in a mission takes its toll. But I worked in Sudan for five years despite the environment and general hostility. After that I was transferred to Liberia, which was very peaceful, compared to other missions, although it has its own challenges. Working as Chief Medical Officer was an opportunity to lead a large group of medical officers and nurses, monitoring the operations of different Mission (military) hospitals, one of which due to my reporting on irregularities, was repatriated for the first time in a peacekeeping mission. This I consider one of my achievements, documenting and reporting irregularities. In Liberia, operations had been very smooth, including evacuations of critically sick personnel. The challenges, as elsewhere in Africa, were principally malaria and infectious diseases. In this country, which was torn apart by civil war, the situation was very serious and UNMIL’s operations were very significant for the country’s stability. Our medical operations played a part in that, and even supported non-UN personnel with serious life threatening medical incidents. This is where we were when Ebola affected Liberia in an unprecedented way. Have you made assessments of Liberian medical clinics to help build Liberian capacity? When it comes to medical support, Liberia has improved over time, but the capacity of the country’s medical sector is still rudimentary due to the civil war, which devastated clinics and hospitals, and caused doctors to leave the country. There was a great brain drain to America and Europe. When I first came to Liberia, there were only a few Liberian doctors and nurses, and the medical facilities were lacking even basic laboratory facilities and supplies. The medical support provided by the Government was very rudimentary. I carried out assessments of national capacity because we had a large number of national staff who had families living here and required medical care. So we made determinations as to whether staff could safely use various facilities. We also kept in contact with national staff whenever they had any family medical problems to assist them. Ebola came to affect the entire region, Liberia in particular, and the Mission’s ability to carry out its mandate. Can you talk about the Mission’s achievements during that period? In February 2014, the first Ebola case was declared in Lofa County. Immediately after the announcement, I traveled there. I received authorization to use a helicopter to carry the Minister of Health, the Director of the World Health Organization (WHO) and myself to inspect the area where the outbreak started. We were at ground zero. We never expected that it would spread like wildfire across the entire country. It moved in phases, but we thought it would eventually stop. It killed so many people and affected so many communities and left so many survivors and orphans. It was devastating and scary. UNMIL’s response was initially to conduct a security assessment. There was a daily Mission leadership meeting, where it was agreed that the Mission needed to stay to support the Government and Liberian people by playing a stabilizing role. This was a remarkable decision by the Mission’s leadership (at the time, SRSG Karin Landgren) and counterparts at headquarters. At the time, there were many organizations and NGOs that were leaving the country because of the uncontrolled situation. People were dying in the streets, and it was scary to go anywhere because you were afraid of people touching you. It was an alarming period. It was around the time that the WHO declared Ebola an emergency situation that affected the entire globe. What was your role at the logistical level and the strategic level? I focused on preventing Ebola and protecting our personnel. UNMIL was scattered at camps and sub-stations across the country, and I had to make sure that personnel were protected. The first thing we did was to order the military to stay in their camps. We developed a protocol to ensure that they were protected: they only left when necessary for reconnaissance and did not leave their car. We also established screening procedures for all personnel exiting and entering the camp, which required personnel to wash their hands whenever entering any facility or moving between parts of facilities. They had their temperatures taken regularly to detect fever. We also established screening at all entrances to UNMIL facilities to ensure that individuals with a fever or general symptoms could be held for further assessment. There were only a few medical staff in Liberia at the time. UNMIL had very few staff at the beginning. We advertised positions but could not attract qualified personnel who wanted to come to the country. We had to search for them. Then our medical officer strength was eventually expanded with eight doctors, and eight nurses working under my supervision. Our morale really improved after their arrival. So it was a very slow process but with more staff our motivation improved. Some medical staff wanted to resign from their positions. For example, one day I was so fatigued that I decided to leave my office for a walk. I saw people lying on the road. One guy was vomiting blood and other people were panicking. I asked myself: should I run or help? I was so scared. Without protective equipment, I was frustrated but had to return back to my office immediately. This was a normal experience for all staff at that time. Was screening itself difficult, because Ebola has a long gestation period? One of the major prevention techniques is temperature measurements. If the person was infected a few minutes previously, a continuous fever will develop within 24 hours. There is no Ebola infection without a fever. So, checking for fever and ensuring that there was no direct hand shaking was essential. We screened everyone coming into compounds using a temperature “gun”, which eliminated the need for physical contact. We also adopted a policy to ensure that sick people did not report to work. If an individual was symptomatic, a doctor would conduct an interview, asking the individual if she or he had been exposed, for instance by going to a funeral. That was a high risk activity for contracting Ebola since, at the time, most funerals were as a result of Ebola infection and due to traditional practice, physical contact was often made with the deceased’s body. We would ask if the individual attended a death ceremony, because in Liberia after a person dies, she or he is laid out, and everyone gives a goodbye kiss on the deceased’s forehead. It was very difficult to convince community members not to go to funerals. At a funeral, one dead body could infect literally hundreds of people. How about by air? Can somebody cough and you are contaminated? It remains controversial. People say one can be contaminated by drops contacting the respiratory system. If your eyes are open it is possible that you can be contaminated. How many people died of Ebola in Liberia? Guinea and Sierra Leone, nearly 5,000 people died here, with a fatality rate of about 45 per cent. One of the major challenges Liberia faced at that time was the safe burial of dead bodies, which was not possible due to the high number of people dying and access in remote neighborhoods. Did UN staff lose their lives to Ebola? Two UNMIL staff members died. I am sorry to say that it was only two, but it could have been many more. The disaster could have been more serious, were it not for our stringent preventive mechanisms. We were exposed as medical staff because we could not leave our work, as it was our professional obligation. We implemented a protocol to minimize cross transmission. We developed an Ebola Rapid Response Team within the small capacity of our medical team. The team went to individual staff member’s houses with protection equipment and assessed health conditions individually, and checked, for example, diarrhoea, fever, and level of exposure to affected persons, including the neighbours. It was important if the neighbour died a few days ago, and if we identified such cases, we transported the person safely without being contaminated, because our staff were wearing full personal protective equipment. We started to follow up with patients over the phone. Médecins Sans Frontières (MSF) did a wonderful job in Liberia. They were the only entity running Ebola treatment units from Lofa County to Monrovia. With time other entities established treatment units (the African Union, Cuba, China, Germany and the US). You can imagine a picture of an Ebola centre, a fenced compound, where patients were isolated, monitored by video cameras to check the patients’ conditions. Even doctors were scared of infection and transmission. The truth is, we did not know about the Ebola virus before the outbreak. Now it is the fact that Ebola is spread by body fluids such as blood and urine, but also through injections by needles. At the time, we did not really know how to effectively avoid contamination. Two UNMIL staff members died. I am sorry to say that it was only two, but it could have been many more. The disaster could have been more serious, were it not for our stringent preventive mechanisms. Every UNMIL staff had to do their daily work while the country was affected by Ebola. I was part of the Senior Management Team that met every day. One of the challenges was to ensure that UNMIL personnel knew how our screening process worked. We informed them that they should avoid any possible exposure. Despite the screening activities, there were problems. For example, the last patient we had was a national staff, who despite all advice, had gone a funeral and also visited his girlfriend who was sick. He just took paracetamol and denied his contact history. He also went through all the check-points (without being detected). He came to our 6th floor clinic. I saw him lying on the floor and I asked him what was wrong. A doctor without full protection examined him. Once suspicion of Ebola infection was made, we immediately evacuated him. He was diagnosed positive but he survived for interesting reasons. Even doctors were scared of infection and transmission. The truth is, we did not know about the Ebola virus before the outbreak. The Americans had an A-level laboratory, one of the best, with a blood and also electrolyte analysis done there. We managed to admit this patient to the American unit instead of evacuating him abroad. That was a heaven on earth during the time of Ebola. The patient survived because of available accessories in that unit. What was the likelihood of survival? The survival rate is difficult to calculate. It depends on many different factors, such as the presence of other illnesses, chronic conditions and the time the patient was admitted for treatment. If you are late to be admitted, the survival rate goes down. The survival rate changes according to when you started fluid replacement. Normally there is a 50 per cent survival rate for Ebola victims. I am sure you dealt with psychological problem of staff, people were debilitated by fear. One particular staff member who is currently alive reminds me of my nightmares of the time. He had an extended family, his wife was a nursing student. She brought Ebola to the family from her practice in public hospital. She was his second wife and he was older than she was. He loved her so much and cared for her selflessly. When she became symptomatic, vomiting and running a fever, other family members were cleaning her with bare hands. He carried his weak wife in a taxi to the unit, and while awaiting being admitted, she died in his arms. He was affected so much, as his kids were also falling sick one after the other, so we quarantined him for a prolonged time to protect his family members. UNMIL personnel were not to come to the office if they got sick. Another rule was, stay home 21 days, and we would monitor over the phone for symptoms. The above staff member was reporting OK during the quarantine period. After around 15 days, he reported that one of his kids was sick. It was a shock. I reported to the Mission leadership suggesting that we provide him special care. We provided some supplies, leaving detergent and bottles of water in front of his door. Then his kids started to die, except one daughter. He had other kids from the previous marriages who were visiting, raising the suspicion that transmission could occur to the other family members. All this time the staff member remained resilient. However, when his last daughter developed fever he started to break up. The SRSG personally requested MSF for special consideration to help his daughter. We were happy that she tested negative for Ebola, and she was discharged to go home. But before he finished the quarantine cycles, another son became sick, and he went through another 21 days of quarantine. One of my nurses also lost her husband, a doctor practicing in public hospital who was exposed to Ebola virus at work. You just saw her and could feel the impact. Every day was a risk. It was a human catastrophe. Did this experience affect you as a doctor? I directed all my staff to strictly follow protection measures. I lost a laboratory technician working with me. We think he got infected while he was taking a blood sample. He wanted to believe that he had malaria and treated himself with malaria medication. It was denial. He continued to work in his laboratory. In doing so, he exposed all others to possible contamination. Through the subsequent analysis with Ministry of Health and Social Welfare experts, we found he was infected with Ebola. We had to quarantine many people because he came to the office, even the Mission’s PX, mosque, another camp, etc. Quarantine was challenging, because everyone had to voluntarily report. You needed to trace everybody, even in remote locations. During the time, there was a videoconference with UN HQ, WHO leadership, medical directors, etc. We appealed to them that the staff should have chances to go to better treatment facilities. For example, an American and an English nurse were evacuated to the US and UK. We were able to evacuate an UNMIL military guy and this laboratory technician to Netherlands and Germany. A few days after arrival in Germany, the lab technician died. Thanks to the German government, the WHO negotiated with Member States so that peacekeepers who were sick could be admitted there. The Netherlands also accepted our request. A medical evacuation plane was provided by a US company. One of my achievements was that I was able to make sure that our peacekeepers were evacuated to better facilities abroad, even though this laboratory technician unfortunately died. Looking back this period, is there anything you’d recommend the Mission do differently? the provision of medical care and ability to respond to public health emergencies like Ebola. 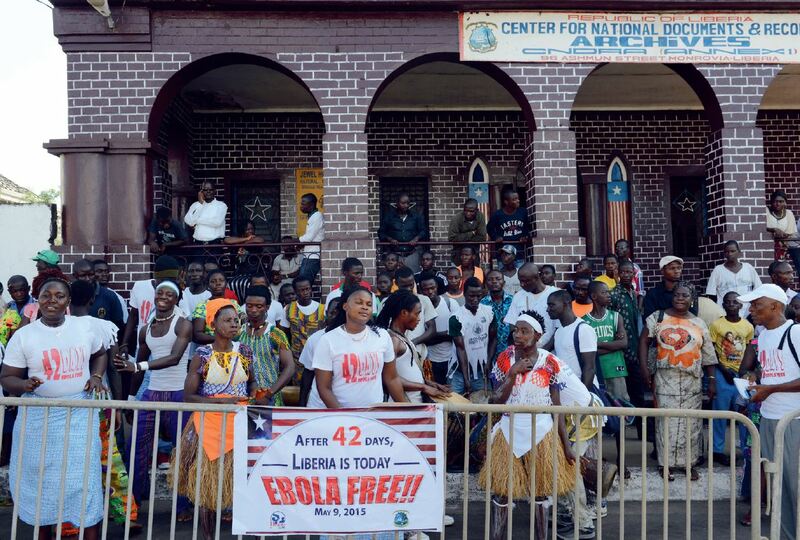 Liberia’s infrastructure was not able to provide the kind of services needed to effectively respond to the outbreak. UNMIL undertook many logistical operations to assist the Government. Our senior logistics officer was co-chairing the Government logistics coordination meetings for Ebola, helping to address the problem quickly. treatment units. We also opened blocked roads. In this country, you cannot go to the regions when it rains because the main transportation arteries of the country become unpassable. Our engineering section worked hard to open roads. The other issue was that UNMIL decided to stay and help the country. This was a strong factor for other NGOs and other entities to have hope and work together. Should UNMIL had been evacuated, they might also have left the country. It was a very important gesture for the Mission to work and support Ebola crisis. Embassies were operating with a minimum number of staff because no one wanted to stay. Most airlines also stopped flying, and UNMIL started operating an UNMIL flight to Accra twice a week that was also opened to others. This flight supported many people. UNMIL decided to stay and help the country. This was a strong factor for other NGOs and other entities to have hope and work together. Should UNMIL had been evacuated, they might also have left the country. It was a very important gesture for the Mission to work and support Ebola crisis. If faced with another crisis with similar proportion, do you think the Mission will do differently? It was a good lesson learned for the international community, including the WHO. No one was prepared for the magnitude of this crisis, of the Ebola epidemic in West Africa. It used to be in East Africa. The WHO was responsive, but it received criticism that it failed to respond in a timely manner to the problem. I am sure that they’ve learned lessons, because the basic health infrastructure at that time was lacking. Now things are improving. I was in Voinjama recently, and I was surprised to see that there are health sectors now developing. Before the Ebola outbreak, there was no basic public health infrastructure. In some hospitals there were no gloves, protection suits or other supplies, and they might have one generator that went on and off. Hospitals cannot function without power. Basically what should have had been improved is currently improving. Taking this lesson into account, these infrastructural improvements are very important. UNMIL is now leaving, and we need to leave our legacy to the UNCT who should continue to work on development in Liberia. They should look at the development of health sector infrastructure, and preventive and preparative measures to avert such disastrous medical emergency situations in a timely manner in the future Infrastructure is the main issue, contingency planning, and any other issues to prepare for any future crisis? Historically, the Ebola global response, though there was delay, saw a record level of global support and coordination. The US, Chinese and German militaries were deployed, and the US in particular came with new models of helicopters and armoured vehicles, as if there was major war. They were not civilians; it was support provided by the army, and it was like the country was invaded by various nations who were actually helping out with a global threat. Following this military-like response, Ebola was contained. There are now adequate treatment units. You won’t return to an outbreak situation the way it was, where a patient was contaminated, waiting for his/her turn to be checked in, told that the facilities are full, and to return to the communities where they then caused the virus to continue to spread. It was a disastrous situation, not only in Liberia but also in neighbouring countries. There would be a different response as infrastructure is in place. I’d say the infrastructure continues to improve. There is now capacity: treatment units, laboratories, and also one referral hospital that was renovated and equipped with new supplies. Experts are also coming to work here. We know that things are in better shape now. So, moving on to the closure of the Mission itself, is there work you will leave unfinished? In my view, peacekeeping is a temporary operation; it is not directly involved in developing infrastructure of the country. Other Agencies, Funds and Programmes, such as the WHO or the UNDP, should take up a good practice based on our experiences and best practices. They should not ignore our experiences. For example, with the help of Pakistani doctors at our Level II hospital, we developed an Ebola contingency plan that did not exist in UN missions before. We were having VTCs with stakeholders like WHO and sharing our experience, challenges and recommendations. This forum was very important to keep our spirits high. Here in the Mission we developed a comprehensive Ebola response contingency plan which was appreciated and later on distributed to other peacekeeping missions. This plan is now updated in many areas of Ebola planning, detection, methods for protection, treatments, quarantine process, contact tracing, de-contamination process, etc. There are methods explained on how to de-contaminate yourself. This plan will be used for future outbreaks. In addition to this, the names, addresses and profiles of medical personnel are kept so that if a similar crisis occurs in the future, someone can pick up a phone and identify such professionals. You’ve worked in Liberia for many years and in other countries. What is your sense of medical care of Liberia for its own people? This is an area of concern. Post-war Liberia is still struggling with development of basic infrastructure like electric power, road and health facilities. In my view, the establishment of new hospitals and health accessories depends on financial capability. When we talk about Liberia, most development indices are still in a rudimentary state; development and improvement are very slow. Education is low. Most youth are not going to school. They are losing another generation. One cannot separate medical infrastructure development from the general development of the country. Do you see the sense of hope? Yes the medical sector has developed hugely over the last few years. Doctors with varied specialties have been hired. There are visiting medical professionals, from the US, Uganda, or hired by special contracts. For ultimate sustainable development, the country should improve school enrolment. Though there is a sign of improving development, the road ahead is very long.